The “GS” in the Taylor GS Mini stands for Grand Symphony. This mini but mighty acoustic guitar is shaped just like Taylor’s Grand Symphony guitar but on a smaller scale. This cuter, lighter, more compact version delivers the same quality as that of its bigger sibling. Taylor describes the GS Mini as a “modern-day parlor guitar.” However, you’re not limited to just playing it around the house or in small, intimate venues. Thanks to its weight and size, you can take the GS Mini along with you anywhere you go. The Taylor GS Mini may look like a tinny toy, but we assure you it’s a true-blue, full-voiced Taylor. Here’s all you need to know about this little acoustic that could. The Taylor GS Mini body measures just 17.625 inches long, 14.375 inches wide and around 4.44 inches deep. The body is actually just a quarter of an inch shallower than the Grand Symphony, so somehow it still feels like a full-size guitar. The guitar has a scale length of 23.5 inches, which is a couple of inches shorter than the scale length of the GS. The nut width is just around 1.687 inches. The shorter scale length makes it easier to play open chords, and even though the body is small, it’s comfortable to play. It’s not too small that you have to hunch over it. The body shape also lets your strumming arm relax more because it doesn’t have to extend as much as when you’re holding a dreadnought. Plus, because it’s shallower, shoulder extension is decreased, adding to playing comfort. It’s a great match for players of all ages, sizes and skill levels, and it surely makes learning to play the guitar fun and pain-free. 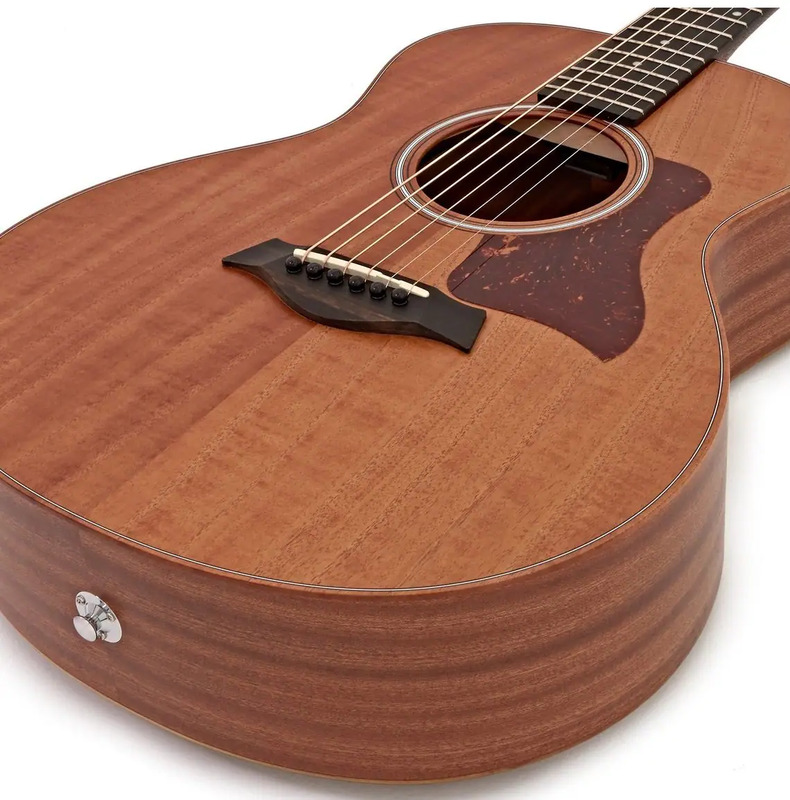 The X-braced top of the GS Mini is made from Sitka spruce while the back and sides are made from layered sapele. The body has been given a nice, thin satin finish. For the 20-fret fingerboard and the bridge, Taylor used real ebony wood from West Africa. The GS Mini actually has the same action and feel as that of a full-size Taylor guitar, thanks to the patented NT neck. The company finds it important that despite its size, the GS Mini should have the playing feel of a full-size guitar. The guitar also features a Nubone nut and compensated Micarta saddle as well as die-cast chrome tuners, a three-ring rosette design and a faux tortoiseshell pickguard. The GS Mini comes with its own protective gig bag. This is Taylor’s way of telling you to take the GS Mini out for a ride. There’s not much to the GS Mini in terms of decoration aside from the pickguard and pearloid dot markers on the fretboard. However, we’ve known Taylor guitars long enough to say that the GS Mini’s visual appeal lies in its simplicity, and you have to hear it to be truly impressed. Whatever it seems to lack in cosmetics it more than makes up for in build and sound quality, which we will discuss later. Being a purely acoustic guitar, the Taylor GS Mini doesn’t come with an onboard electronics system but there is an aftermarket pickup that’s been designed just for it. Called the ES-Go, this passive magnetic soundhole pickup is based on Taylor’s Expression System, or ES technology. It can be installed in minutes using a screwdriver. The black pickup is visually discreet. The GS Mini is equipped with a pre-fitted bracket inside it – just under the fingerboard – where you can clip on the ES-Go. Once connected, the pickup floats in the soundhole. Taylor recommends pairing the pickup with the V-Cable cord, which comes with a built-in volume control. The depth of the Taylor GS Mini’s body doesn’t only make it feel like a full-size acoustic guitar. It also gives the GS Mini a volume that exceeds its size. Aside from impressive projection, the GS Mini is also capable of producing a warm, balanced and clear tone, thanks to the tonewoods used in its construction. It’s got a wide dynamic range and is suitable for various playing styles. Bass and trebles are rich and bright, but where the guitar really shines is in the midrange, making it ideal for solo players or those who like jamming in small groups. Of course, the GS Mini doesn’t really have the full harmonic capability of the Grand Symphony or other full-sized guitars, but for its size it performs beyond expectations. It definitely offers more than what other made-for-travel guitars have: a good bass and volume, with the tone and playability of a standard-size model. Articulating melodies across all strings can be an issue with small acoustic guitars. Not so with the GS Mini, which delivers crisp, clear notes without a hitch. This means that whether you’re playing single-line riffs or complex melodies, every note will be heard loud and clear. It also has a good sustain for a small guitar. All of the GS Mini models are available in a left-handed configuration. The GS Mini-e models come equipped with a Taylor ES-B pickup and preamp system. The onboard electronics features tone and volume controls, a tuner and a battery indicator. Some models, like the GS Mini Blackwood and the GS Mini Koa, are now considered Legacy Models, which means Taylor does not manufacture them anymore. If you’re interested in these discontinued models, you can get in touch with an authorized Taylor dealer to check if they still have any left in stock. Why buy the Taylor GS Mini? With travel guitars, players would often settle for one characteristic over another. Portability gets substituted for tone, or construction for affordability. This is why many guitarists end up with travel guitars that simply fail to wow. Some even end up inadvertently amassing a collection of these small guitars, many of which simply end up as wall decor. The Taylor GS Mini is not one of those guitars. With a Taylor, you really get what you pay for: quality, durability and an excellent tone that players and their audiences find irresistible. It’s priced at around $500, gig bag included. If you’re looking for a great guitar at that price range, one that will not let you down whether you’re practicing by yourself or playing in your neighborhood cafe, one that will serve as your reliable companion for years, the GS Mini is definitely worth checking out.